Chris Kovarik has been a strong figure and personality in the mountain bike world since he first burst on the world cup racing scene in ’98. Under his belt, he holds several national, international and world cup wins as well as track records, winning margin records and countless podium appearances at all levels of the sport. His aggressive riding style make him a favourite with the media and his skills on a bike are owed to his natural ability and years of dedication and experience. Claire Buchar is known for her dedication to the sport, having spent most of her career as a privateer. She is a talented rider with a lot of heart. As a 12 time Canadian National Team Member, World Championships Bronze Medalist, multiple Canadian National Champion, media regular and coach, Claire is a true ambassador of mountain biking. 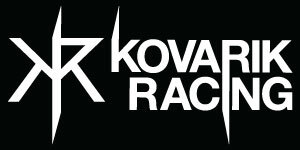 Kovarik Racing is a progression of Chris and Claire’s riding careers. It is a place from which they can offer all aspects of their trade: Racing, Coaching, Mentoring, Rider Development and Brand Ambassadorship.